Removes the armor/weapon type restrictions on all enchantments (including modded enchantments) using an SKSE plugin, no conflicts. The Skyrim Script Extender (SKSE), Version 1.6.15 (or newer) is REQUIRED to run the No Enchantment Restrictions plugin. An SKSE plugin to remove the armor/weapon type restriction on all enchantments. PLEASE NOTE: You STILL cannot add weapon enchantments to armors. The game engine just doesn't support this, no mod will make this happen. 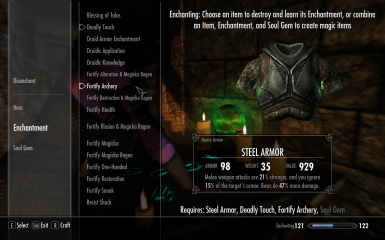 Normally, all enchantments have a "Worn Restrictions" option, this consists of a FormList that contains keywords of Armor or Weapons e.g. "ClothingBoots" to determine what to restrict the enchantment to. Leaving this as "NONE" indicates that it cannot be applied to anything, yet the enchantment can still be learned by disenchanting. When the game finishes loading all assets it will create a new FormList internally, add ALL currently loaded keywords to it, then apply the FormList to ALL enchantments. Essentially this means that any keyword will fill the Worn restriction and allow for enchanting to occur on any armor or weapon type. Unfortunately because of how the engine works, this does not allow for weapon enchantments to be applied to armors or vice-versa. Isn't incompatible with anything, it's an SKSE plugin. There is nothing for it to conflict with. Click the Download with manager button on top of the file. No Enchantment Restrictions will appear in in NMM's Mods list once it's downloaded. Double-click the "No Enchantment Restrictions" entry to Activate it. Start NMM and click on Mods. In the left icon bar, click on Add Mod From File and select the downloaded archive file. No Enchantment Restrictions will now appear in the list. Double-click to Activate it. Locate the Data/ folder in your Skyrim installation directory. Typically it's found at Program Files/Steam/steamapps/common/skyrim/Data/. Extract the contents of the downloaded archive file to your Data/ folder.